H.B. Pool & Spa offers acid washing services at affordable prices. When your swimming pool has gotten a bit out of hand and needs a heavy cleaning job, acid washing is the way to go. Our pool technicians perform every job with the highest safety and quality to ensure a successful acid wash. When swimming pool owner's notice staining on their pool surfaces, particular the bottom surface floor, it's likely that an acid wash is the best way to remove any heavy algae, stains or eroded material built over time. 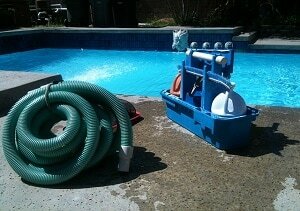 We're your go to company for an immediately cleaning maintenance to restore your pool back to tip-top condition. "...referred as the best acid wash service in Huntington Beach"
If you're in question, most pools needing acid washing experience heavy arrays of algae build-ups, brown-fused stains on pool surfaces, fading of true pool water color and possible changes in water density. If proper pool care or sitting water isn't winterizing correctly, these conditions will appear ten out of ten times. HB Pool Service can provide professional acid washing services while explaining to pool owners and managers on steps to take to reduce the amount of times a pool needs to be acid washed. Known as the "drain and clean," acid washing removes a thin layer of your pools surface, whether that be plaster, gunite or Pebble-Tec. Using acidic compounds that allow the technician to penetrate the surface, the affected surfaces would be rid of the algae and stains and expose a fresh new surface of the pool. It's recommended that pool owners acid wash their pools at least once a year to ensure the quality of the pool stay in tact, clean and safe for all users. Our pool technicians take care of immediate and contract needs for our clients and send reminder emails and notifications to make sure our clients are aware when recommended services are required. Not only can Huntington Beach Pool Service & Spa perform high quality acid services, we can also ensure the highest standard of safety after every acid washing. Upon finishing each acid wash, the pool technicians remove the acidic compounds from their brushing device in a designated clean-out. After all compound has been removed, the pool technician then performs a routine water cleanse of the swimming pool to put the cherry on top to complete the service. We always end each service by checking the pH levels in time intervals to mark the treated pool as safe to operate. Whether we are performing pool repair services or pool cleaning, our pool cleaners and technicians know how to perform an acid wash job due to the constant need to immediately treat a pool if it reaches an unsafe tipping point. We know how important a safe pool is to our clients and we'll clean and wash any disturbance to bring each swimming pol back to life. Interested in immediate acid washing for your swimming pool facility? We're more than happy to go over our pricing plans and service overview. Huntington Beach Pool Service Co.